This article first appeared in Christian Research Journal, volume 34, number 02 (2011). Joseph Smith, Jr., the founder of the Church of Jesus Christ of Latter-day Saints (LDS, or Mormons), claimed that after both God the Father and Jesus Christ visited him in 1820, an angel named Moroni, an ancient Nephite warrior, visited him in the fall of 1823. Smith was told by Moroni how he had buried gold plates fourteen centuries earlier not far from the Smith farm near Palmyra, New York. The angel said that they contained a record of ancient inhabitants and the “source from whence they sprang.” Smith claimed he was prohibited from retrieving the gold record for another four years. The story of the gold plates is an absolutely essential part of the Mormon narrative, for in the eyes of many Latter-day Saints, the coming forth of this record, and its subsequent translation into the Book of Mormon, legitimizes their belief that Smith was indeed a prophet sent by God to restore the true Christian faith lost long ago due to a “great apostasy.” The story of the gold plates cannot be underestimated, for without them there can be no Book of Mormon. Though many members of the LDS Church are very familiar with this story, the details surrounding how Smith obtained the plates, how he “translated” the plates, and how a few chosen men saw the plates, have compelled some within the LDS Church to challenge the main components of the account in order to make it sound more credible. “Do you believe Joseph Smith had gold plates?” Hundreds of members of the Church of Jesus Christ of Latter-day Saints heading towards the grassy area below the majestic Manti temple hear my question. They are among thousands who come to Manti to watch the Mormon Miracle Pageant, an evening outdoor play held two weeks every year in this otherwise tiny town located in central Utah. Most of those walking by ignore my question; others, however, bravely agree without hesitation that their founding prophet, Joseph Smith, Jr., did indeed have plates of gold, and from those plates he translated what they believe is “the most correct of any book on earth,” the Book of Mormon. Many return from inside the temple grounds out of curiosity, wondering why I ask what appears to be an obviously simple question. As with much of LDS history, Smith’s retrieval of the gold plates is a story of incredible drama. Several LDS historians and Church manuals have repeated the story given by Lucy Mack Smith, the mother of the Mormon prophet.1 In her account, she says that her son took the plates from their secret place and, “wrapping them in his linen frock, placed them under his arm and started for home.” After “traveling some distance,” he “came to a large windfall, and as he was jumping over a log, a man sprang up from behind it and gave him a heavy blow with a gun. Joseph turned around and knocked him down, then ran at the top of his speed.”2 She said her son was attacked twice more, and since there is no record of Smith rendering his assailants unconscious or incapacitated, we must assume he outran them for at least a portion of the distance necessary to reach the Smith home three miles away. We must also assume that he did all this with a slight limp that he received from a childhood surgery. There is no uniform consensus as to the size or weight of the plates Joseph Smith claimed to have in his possession. Contemporaries of Smith gave varying dimensions for the plates, as well as a wide range of estimated weights. Some say the plates weighed as much as sixty pounds, while others, like Joseph Smith’s father, said the plates weighed as little as thirty pounds. Smith claimed the record he received from the angel was “six inches wide and eight inches long, and not quite so thick as common tin.” He also said the “volume was something near six inches in thickness, a part of which was sealed.”3 Given these dimensions, we can conclude that the plates were one-sixth of a cubic foot. Since gold weighs 1,204 pounds per cubic foot, we can agree with LDS Apostle John Widtsoe who said, “If the gold were pure, [the plates] would weigh two hundred pounds, which would be a heavy weight for a man to carry, even though he were of the athletic type of Joseph Smith.”4 Though several illustrations of the plates depict what looks like a virtual compressed set of metal sheets, Mormons often insist that handmade gold plates would not lay perfectly flat, thus allowing for air gaps between the leaves, making them much lighter. This argument ignores the fact that gold, while an extremely dense metal, is also very soft. The very weight of the plates themselves would eliminate any air gaps, thus making the plates a virtual block of gold. Is this theory plausible? As a longtime volunteer at the Utah Lighthouse Book Store in Salt Lake City, I have watched many visitors attempt to lift a replica set of plates that are the same dimensions given by Joseph Smith (6x8x6). Made of lead, the replica weighs 118.3 pounds, or a little over a pound more than the weight suggested by Widtsoe. Most are unable to even budge the replica. On the second try, some do lift the plates, but only barely off its pedestal. Everyone who attempts to lift the replica admits it is impossible to carry such a weight for a distance of three miles, much less run at top speed to avoid thieves wanting to steal them. Realizing that the story, as told, is quite impossible, many Mormons resort to assuming that God gave Smith supernatural strength to carry the plates. Mormons who offer this explanation at least seem to recognize that the story needs a bit of revision to be believable. However, such an explanation is nothing more than an argument from silence. Smith never said he needed God’s help to carry (or run with) the plates, and he certainly never gave God credit for enabling him to do so. One of the best arguments against supernatural intervention is the witness of the Mormon apologetic community, which realizes that there is no evidence supporting the need for supernatural strength. To salvage the story, Mormon apologists have worked hard to concoct a theory that gets the weight of the plates down to a manageable level. If God really intervened by bestowing Smith and others with superhuman abilities, this would be unnecessary. Though I tend to agree with Welch that plates of pure gold would be too fragile to be useful, the fact remains that Mosiah 8:9 in the Book of Mormon speaks of twenty-four Jaredite plates “which are filled with engravings, and they are of pure gold.” The translation of these plates allegedly makes up the present-day Book of Ether found near the end of the Book of Mormon. Tumbaga is an alloy composed mostly of gold and copper, the percentage or carat weight of each metal varying dramatically. Given the name by the Spanish conquerors, examples of tumbaga artifacts have been found throughout Central America. When treated with an acid, such as citric acid, the gold portion on the surface of the object becomes predominant. It can then be polished. It makes sense that Mormons who argue for tumbaga plates also insist that the Book of Mormon lands were in Central America. However, this “limited geography” theory is in and of itself a controversy within Mormon circles. While many BYU professors are proponents of the limited geography theory, there is a growing number of members who insist that the Book of Mormon lands were located in the northeastern United States, where tumbaga is not found. Given these factors, Putnam offers approximate weights based solely on mathematical figures regarding plates made of 8-carat gold and 12-carat gold. He concludes that plates made of 8-carat gold, with “3-percent native impurity would weigh 106.88 pounds.” Assuming that the plates were not perfectly flat, he then arbitrarily adds, not a 10 percent air gap as John Widtsoe did, but an amazing 50 percent air gap! By doing so, he estimates that the plates probably weighed fifty-three pounds. Using the same capricious estimate of a 50 percent air gap, he concludes the heavier 12-carat plates would weigh 86.83 pounds. This naturally assumes that all six inches of the plates contained a 50 percent air gap between each plate. Though tumbaga is generally stronger than pure gold, it is likely that the plates at the bottom of the stack would flatten out due to the weight of six inches worth of plates. 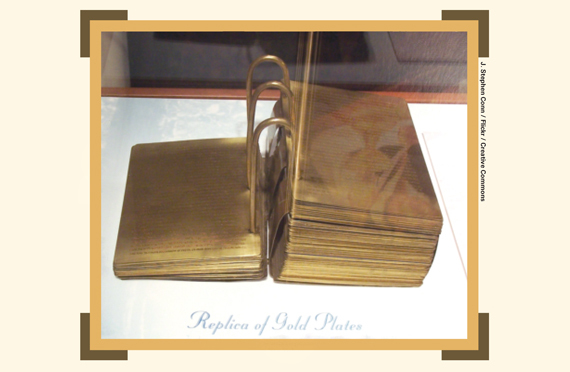 In 2009, the LDS Church showcased a temporary display at the Church History Museum in Salt Lake City that allowed visitors to feel how heavy Joseph Smith’s gold plates were. Fastened to a handle that enabled a person to lift them without potential injury, visitors were told the plates they were lifting were fifty pounds, or similar to the weight suggested by Putnam. Besides the fact that visitors were only lifting them a few inches and not carrying them for a distance of three miles, the demonstration had a major flaw. The display only included about forty-three plates of an unknown metal; the rest of the “plates” were nothing more than what appeared to be a weighted chunk of plaster. Why did the LDS Church display a replica that was not composed entirely of metal pages? Certainly this multi-billion dollar corporation could easily afford to use a comparable metal and produce a facsimile in 2009 that was at least close to what they believe ancient Nephites made long ago. Instead, visitors were provided a replica that conformed merely to an arbitrary weight, suggesting the church may have been unable to produce an all-metal replica light enough to lift. While many paintings and drawings depict Joseph Smith looking directly at the plates during the translation process, Smith himself said the Lord provided “two stones in silver bows” that he called the “Urim and Thummim.” Fastened to a breastplate, they resembled large spectacles that enabled Smith to translate the plates into English.17 I can’t recall any church publication depicting Smith wearing such a device. In 1993, Mormon Apostle Russell M. Nelson recounted the testimony of David Whitmer who concurred with Emma’s description. Whitmer said that when Smith placed the rock in a hat, “a piece of something resembling parchment would appear, and on that appeared the writing. One character at a time would appear, and under it was the interpretation in English.”19 Since such descriptions show how Smith didn’t need to look at the plates, one can only wonder why God risked Smith’s safety to obtain them in the first place. According to Mormon Apostle Jeffrey Holland, “Everything of saving significance in the Church stands or falls on the truthfulness of the Book of Mormon and, by implication, the Prophet Joseph Smith’s account of how it came forth is as sobering as it is true. It is a ‘sudden death’ proposition. Either the Book of Mormon is what the Prophet Joseph said it is, or this Church and its founder are false, a deception from the first instance onward.”22 Though such a comment may bolster the faith of many Latter-day Saints, the evidence suggests that the story of Smith recovering the gold plates, revered by many faithful Latter-day Saints, is nothing but a fabrication of Smith’s fertile mind. Looking at the big picture it seems clear that Smith never had an ancient record of historical people who once inhabited the American continent. Without the gold plates, the Book of Mormon is relegated to nothing more than a nineteenth-century fictional novel. Bill McKeever is the founder and president of Mormonism Research Ministry (www.mrm.org), a Christian ministry based in the Salt Lake City area of Utah. Bill is the author of four books, includingIn Their Own Words: A Collection of Mormon Quotations (Morris Publishing, 2010). See Richard L. Bushman, Rough Stone Rolling (New York: Alfred A. Knopf, 2005), 60. See also Church History in the Fulness of Times: Religion 341 through 343 (Salt Lake City: The Church of Jesus Christ of Latter-day Saints, 2003), 44–45. Lucy Mack Smith, History of Joseph Smith by His Mother (Salt Lake City: Stevens and Wallis, 1945), 108. History of the Church (Salt Lake City: Deseret Book Company, 1973), 4:537. John A. Widtsoe and Franklin S. Harris, Jr., Seven Claims of the Book of Mormon (Salt Lake City: Deseret News Press, 1937), 37. Henrichsen, “What Did the Golden Plates Look Like?” New Era, July 2007, 29. Gordon Hinckley, Ensign, May 1989, 46. Saints’ Herald, February 15, 1878, 57. Dean C. Jessee, “Lucy Mack Smith’s 1829 Letter to Mary Smith Pierce,” BYU Studies, Fall 1982, 461. 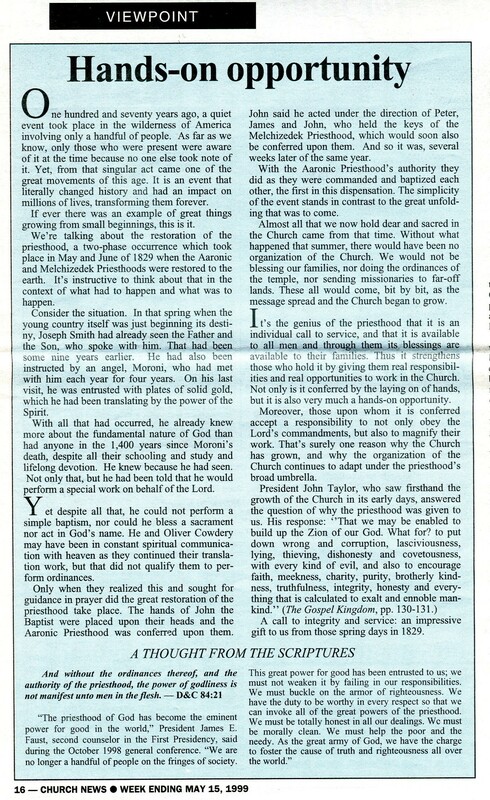 Church News, May 15, 1999, 16. See original print edition here. It should be noted that the electronic version of this article has changed the phrase, “solid gold plates,” to read simply, “gold plates”; See http://www.ldschurchnews.com/articles/35786/Hands-on-opportunity.html. John W. Welch, ed., Reexploring the Book of Mormon (Salt Lake City: Deseret Book, 1992), 276. John L. Sorenson, An Ancient American Setting for the Book of Mormon (Provo, UT: Foundation for Ancient Research and Mormon Studies, 1996), 283. Read H. Putnam, “Were the Golden Plates Made of Tumbaga?” The Improvement Era, September 1966, 789. Emma Smith Bidamon, “Last Testimony of Sister Emma,” Saints Herald, October 1, 1879, 289. Russell M. Nelson, “A Treasured Testament,” Ensign, July 1993, 61. Citing David Whitmer, An Address to All Believers in Christ, 12. “Brodie Revisited: A Reappraisal,” Dialogue: A Journal of Mormon Thought 7, 4 (1972): 83. History of the Church (Salt Lake City: Deseret Book, 1973), 1:52–55. Jeffrey R. Holland, Christ and the New Covenant: The Messianic Message of the Book of Mormon (Salt Lake City: Deseret Book, 1997), 345–46. Can you lift the plates? The reactions of Mormons who attempt to lift the “gold” plates owned by Bill McKeever before a June 2014 Mormon Miracle Pageant in Manti. For more articles on the Standard Works in Mormonism, click here.